Being able to move freely is essential for a healthy life, so you can manage your daily activities, work and recreation. Stiffness and inflexibility will develop if you lead an inactive life, making movement difficult and painful. If movement is difficult, it's hard to exercise. But exercise is vital for maintaining your health and lowering your risk for conditions like diabetes, high blood pressure and heart disease, risks that are higher if you are overweight. 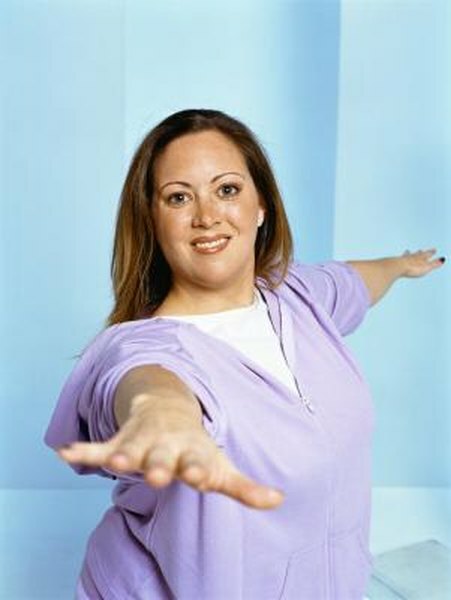 If you are overweight or obese, you can perform the same stretches as anyone else. However, if you have been inactive, you may not be very flexible and may not be able to stretch as fully as someone more fit. Begin with stretches you can perform while sitting or lying down, to reduce strain on your joints. Exercising in a swimming pool supports your weight, so that you are less likely to injure your joints when you begin stretching. Begin your stretching exercises with a warmup. Any low-impact aerobic activity will do, such as walking. Warm up for five to 10 minutes before stretching. This allows your muscles, tendons and ligaments to increase in temperature, and tissue fluid will become more liquid, making movement easier. When you are warm, you can begin stretching. Use good form, which means paying attention to how each stretch is correctly performed and trying to do it correctly every time. You may want to take a class or work with a trainer at first. Do static stretches instead of bouncing in and out of a stretch. Hold each stretch for 10 to 30 seconds, and repeat at least four times. Stretch every day, and pay special attention to your lower back, hips, legs and shoulders. Lie on your back with your knees bent and feet flat on the floor. Press your lower back into the floor and hold the position for 10 seconds. Repeat four times. Lying on the floor, bring both knees up to your chest and hold them with your arms for at least 10 seconds. Repeat at least four times. Lying on your back, with one knee bent and the foot flat on the floor, pull the straight leg toward your chest, grasping it just above and below the knee with your hands. Hold for 10 seconds, repeat four times. Sit on the floor with the soles of your feet together and your knees out. Press gently on your knees with your hands, while keeping your spine straight. Sitting on the floor with one leg straight in front of you, bring the foot of the other leg up to the knee of the straight leg. Hold that position while you bend forward from your hips toward the bent knee. Sitting on the floor with both legs out in front of you in a V, lean forward from your hips as far as you can while keeping your back straight. Hold the position for 10 seconds and then relax. Repeat four times. Standing in a doorway, grasp the door frame with one hand and turn your body away until you feel a stretch in the front of your shoulder. Hold for 10 seconds and repeat four times. In the same position, turn your body so that you are pulling your arm across your chest, until you feel a stretch at the back of your shoulder. Hold as usual. Raise one arm up over your head and drop your hand behind your neck. Use the other hand to push your elbow gently backward until you feel a stretch in your shoulder joint. Hold as usual.